This 50 m2 attic space is a perfect choice for design minded visitors with the added privilege of staying in L'Eixample, the number 1 neighbourhood for architecture and shopping, and certainly a pretty good choice for fine dining and general nightlife as well. The redesign of the apartment has accentuated open space allowing natural light free access through a glass ceiling in the kitchen, from the terrace and bedroom window. The apartments has been featured in the La Vanguardia magazine as an example of excellent exploitation of space. The apartment has a clean and rustic air with chequered patterned floor-tiles, large wooden crossbeams with every room held in subdued, delicate colors. For two couples travelling, or a family, there is a double bed, and a sofa bed that sleeps two as well. The kitchen is practically constructed to allow hobby-chefs maximum comfort when preparing meals. An added treat includes a 10 m2 terrace where to sit and enjoy the Mediterranean climate. In a city known for its spectacular markets, one of them is never far off, and the fine Porvenir Ninot market is located just three blocks from the apartment. Barcelona Estació de Sants - 18 min. Francesc Macià T1, T2, T3 - 11 min. T1 Aerobus + Bus - 52 min. T2 Aerobus + Bus - 50 min. 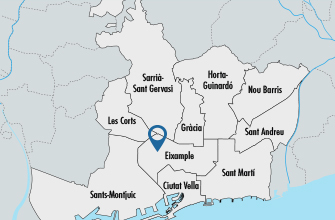 From AP-7 / France, Girona >> 133 Km continue onto C-33 (inside Barcelona is Meridiana Av. )>> in 19 Km turn right onto carrer d’Aragó, after 3 Km see detailed map of the booking confirmation. The location is ideal if having a retreat in a quiet street in one of the city’s most vibrant nightlife, high-end dining and shopping areas sounds tempting. The apartment is literarily around the corner of the well known Hospital Clinic of Barcelona and from some of the key buildings in the portfolio of the city‘s great architect Antonio Gaudí. Within walking distance you will find the street Passeig Gracia home to key-works like Casa Batlló and Casa Milà. This is also the street where you‘ll find Barcelona’s most exclusive shopping options. The adjacent, more bargain-friendly Rambla Catalunya has its share of alternatives as well, while offering a chair and a table along the Las Ramblas to relax with a snack. The excellent Barcelona Metro service will quickly bring you around the city and both the Hospital Clinic metro station, and one of Barcelona’s main train stations Sants Estació are close by - Making it a breeze to hit the beaches or any of the amazing sights the city has to offer that are not in the immediate vicinity. Great location. Fun space. Friendly host. Perfect host and stay! We’ll Come back!